Learn how to get started editing video in just 30 minutes. 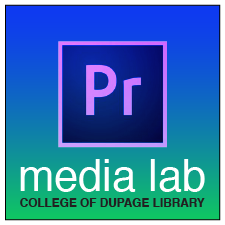 In this Crash Course, Media Lab staff will walk you through how to start a project in Adobe Premiere Pro, and provide tips and advice on basic editing techniques, how to add text to your video, how to share your finished video, and more. These workshops repeat every week, so if you need a refresher or want to come ask specific questions you can drop in every Tuesday and Friday. All workshops meet in SRC 2024 on the first floor of the Library near the Media Lab. Crash Courses are held every Tuesday from 2-2:30pm and every Friday from 10-10:30am.